London [UK], Mar 15 (ANI): New Zealand pacer Neil Wagner is riding on an all-time high as he has reached the number five position in the ICC Test bowler rankings after an impressive performance in the second Test match against Bangladesh. Dubai [UAE], Mar 13 (ANI): New Zealand's Neil Wagner after his stunning performance in the second Test match of the three-match series against Bangladesh, has attained his career-best fifth position in ICC Test bowlers rankings. 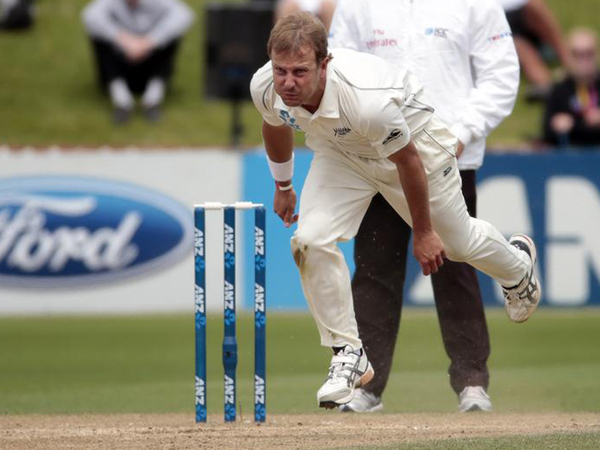 Wellington [New Zealand], Mar 12 (ANI): Hostile spells from pacers Neil Wagner and Trent Boult helped New Zealand to take an unassailable lead in the three-match Test series against Bangladesh today. Hamilton [New Zealand], December 12 (ANI): New Zealand bowlers steadily swept aside West Indies' batting line-up to post a crushing 240-run win over West Indies on the fourth day of second Test to wrap up the two-match series 2-0 at the Seddon Park in Hamilton. Barbados [West Indies], December 12 (ANI): West Indies batsman Sunil Ambris has been ruled out of the upcoming three-match ODI series against New Zealand due to a fractured forearm. Wellington [New Zealand], December 1 (ANI): Left-arm seamer Neil Wagner clinched his career-best seven-wicket haul to put New Zealand in charge at stumps on Day One of the opening Test of the two-match series against West Indies at the Basin Reserve in Wellington on Friday.